We have been previously told in the Synaxarion of the Deposition of the Honorable Zoni in the Holy Coffin commemorated on August 31st, that the Zoni was brought from the Diocese of Zela in Pontus to Constantinople during the reign of Justinian. According to Saint Nikodemos the Hagiorite, he believes Emperor Arkadios brought the Zoni from the Diocese of Zela to Constantinople, not from Jerusalem. 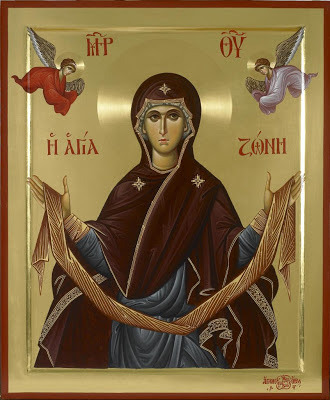 There seems to be confusion between the story of the Robe and Zoni of the Theotokos. This explanation is substantiated by the Golden Bull found by Emperor Leo. However, in the Synaxarion of Constantinople for April 12th, we celebrate the translation of the Zoni from the Diocese of Zela to Constantinople in the year 919, during the reign of Constantine and Romanos Porphyrogennetos. This only adds to the confusion, and requires a critical examination by historians. If all is to be considered somewhat trustworthy, perhaps Arkadios brought it from Jerusalem to Constantinople, then from Constantinople it was brought to the Diocese of Zela but returned to Constantinople during the reign of Justinian. Then it may have been brought to the Diocese of Zela once again and Leo either opened it there or in Constantinople to which it was returned again, then a few years later during the reign of the Constantine and Romanos it was returned to Constantinople again. Though this is possible, it seems unlikely. The other possible explanation is that these could only be portions of the divided Zoni. * The iambic verses come from a manuscript of the Menaion from the 16th century.